Are you looking for presents or art pieces that have that “wow” factor? 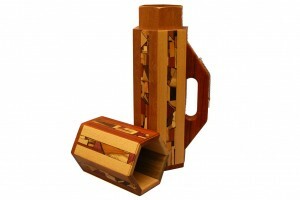 All Etz-Ron – Wooden Judaica, Wood Art and Handmade Jewelry pieces are one-of-a-kind creations with built in “wow” factor! 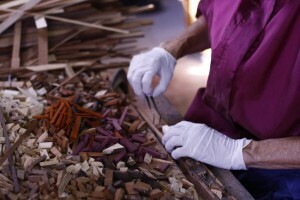 From my signature wooden mosaics, to branding pyrography, wood carving, coloring wood to using multiple metals to create interesting contemporary jewelry, all are unique. For you, that means, when you gift yourself or others, you can be assured that you will have something of beauty and value that is original. Have a look at the testimonial page to see what my customers have said. I have been hand crafting beautiful and functional objects from wood for over 25 years. I love the warmth that wood gives and the versatility, natural beauty and amazing variations of wood hues, and I want you to love wood as well. Judaica came into my life as a logical progression when I met and married my husband, Jack. He has lots of ideas for everything Jewish. My work combines the spiritual and the practical resulting in functional and beautiful art pieces used to celebrate the Jewish Holidays as well as functional pieces for the home and office.. Many of the skills I have honed over the years woodworking translate directly to metal working. Not surprisingly, my jewelry work is a continuation of my woodworking. I like the contrasts of the different metals and the way the light plays on textures that I create on the metals. Recently, I have created a line of wooden jewelry, with both natural wood and painted woods with pyrographic detailing. Check out the Wooden Jewelry page. I pride myself on listening to what you want. If you have any questions or want something you don’t see here, contact me and let’s talk. Meantime, click here to see these art pieces I have been making for you. 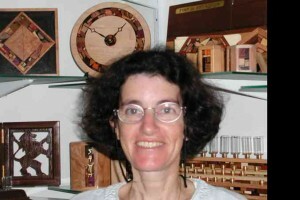 For over 25 years I have been crafting elegant wooden Judaica, wood art, and handmade jewelry. I chose wood as my palette because I love it’s versatility, natural beauty and amazing variations of wood grains and hues..
Each piece I make is unique- handcrafted from woods found in Israel and around the world and decorated with clean flowing textures: be it mosaic work, carving, pyrography, painting, or texturing on wood and metals. My goal is to provide you with creative and functional designs that will bring warmth into the spaces where you live: your homes, your workplace and your synagogue. My work has been featured in Judaica 500 by Lark Books, and select pieces have been exhibited in museums in Norway, Ohio, and Israel. Over the years I have participated in juried art shows all across the United States. I pride myself on listening to what you want. If you have any questions or you have an idea, contact me and let’s talk. I am always available by telephone or email. For custom work, I will send you a sketch to ensure that our visions match. It is important to me that you see what you’ll be getting, and that you fall in love with the final product. Don’t forget to check out the testimonial page to hear the feedback my customers have sent me. I was born in Chicago and educated at the University of Illinois. I trained as a professional cabinetmaker at two trade schools in Norway. (If you want the long version of how I arrived to woodworking click here). 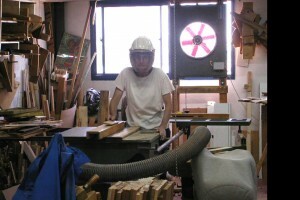 I have worked as a cabinetmaker in both the USA and Israel. For the last 25 years, I have been working in my studio in Beer Sheva, Israel, creating original designs of Judaica, functional wood art, and wood and silver jewelry. This year, in addition to running my studio, I volunteer teaching woodworking to injured soldiers. I find it very challenging and rewarding. I am an avid hiker and biker and live with my husband, children and dogs in Beer Sheva.